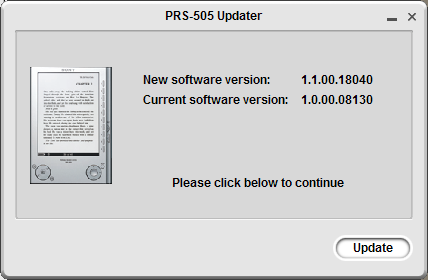 After all the recent messing about with a certain entertaining, yet childish security consultant (sic), I totally missed that Sony had finally released the new firmware for the SONY PRS-505 (version 1.1). After ordering one a few months back and finding the PDF reading to be terrible, I’d left it unplugged on my desk for so long that it was almost as dusty as a normal book. Still, I’ve brushed it off now, charged the little thing back up and installed the new firmware. I’ll let you know how it goes with PDF’s. Let’s hope it’s better than before. I’ve also upgraded the libprs500 software to the new version, which is now called Calibre. Much better than the software provided with the SONY unit.